CHICAGO — Political seasons always draw our attention sharply to the issues of the day. 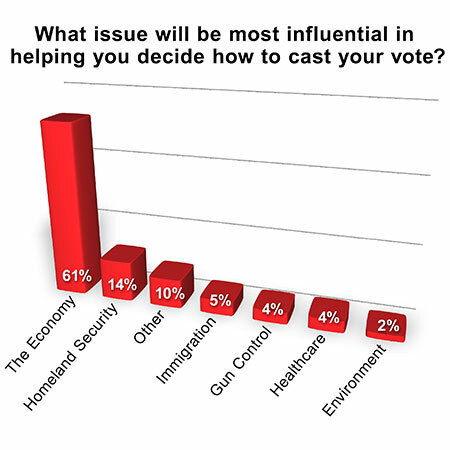 Sixty-one percent of dry cleaners who responded to this month’s American Drycleaner Your Views survey say that, among today’s chief political issues, the economy will most influence the ballot they cast for president this fall. No other choices—homeland security (14%), “other” (10%), immigration (5%), gun control (4%), healthcare (4%) and the enviroment (2%)—were even close. Nearly two-thirds of dry cleaners responding (65%) say they support the Republican ticket of Donald Trump and Mike Pence. Twelve percent favor Democrats Hillary Clinton and Tim Kaine, and 4% support Libertarians Gary Johnson and Bill Weld. Nineteen percent of respondents aren’t sure who they will vote for. No one taking the survey favors the Green Party ticket or a party other than those previously identified. 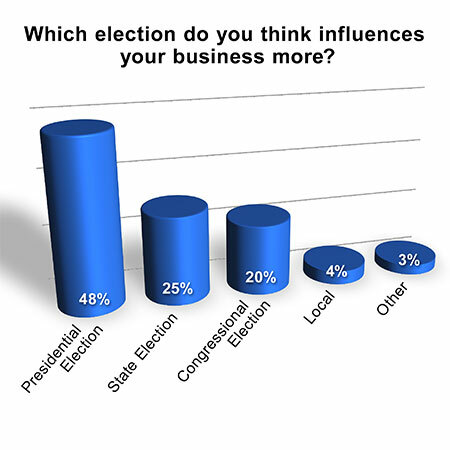 Which election do you think influences your business more? Among the majority of respondents, it’s the presidential election (48%). Next is state elections (25%), followed by congressional (20%), local (4%) and “other” (3%). The American Drycleaner Your Views survey is a snapshot of the audience’s views and is in no way scientific. Qualified subscribers to American Drycleaner e-mails are invited to participate anonymously in a survey each quarter.